This property in North Charleston was once part of a prosperous rice producing estate known as Retreat Plantation. The plantation house was located on a slight rise where the present day structure known as Quarters H-I stands. One would see the sprawling Riverfront Park while standing at the former house site today, and looking towards the Cooper River. 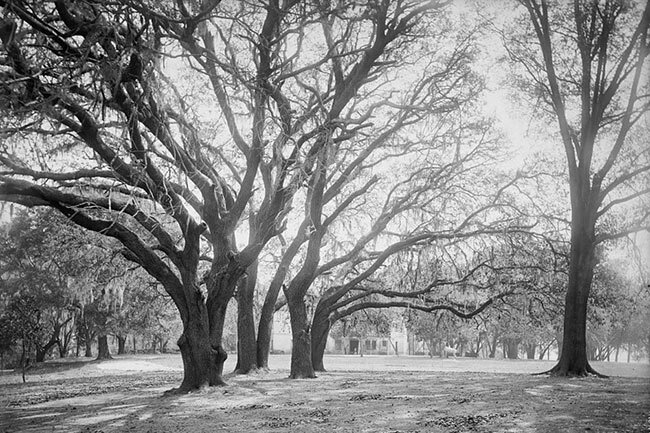 In 1895, the plantation was purchased by the City of Charleston for the creation of a new public park to be named Chicora Park. The park was designed by the famed Olmsted Brothers who were responsible for properties such as Central Park in New York City and The Biltmore Estate in Asheville, North Carolina. The vision they had for Chicora Park was to be a sort of Central Park of the Lowcountry. 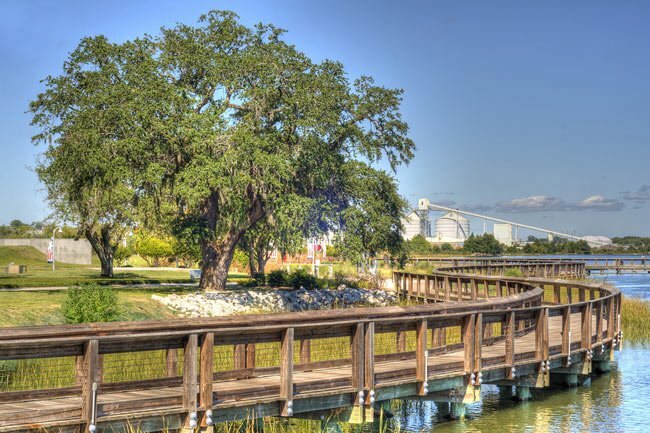 Trolleys departed from Charleston and offered day trips to the park which featured salt water lagoons, athletic fields, meadows, walking trails and landscaped gardens. The park, although well loved, did not last long with the need for the creation of a new Naval Base. 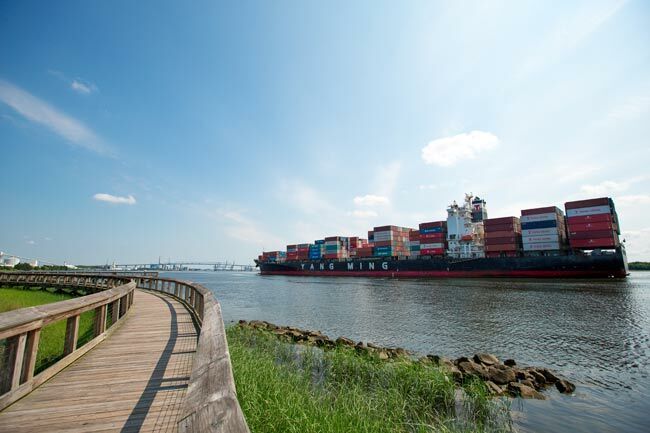 This site with its river frontage was the perfect place and in 1901, the United States Government purchased the property from the City of Charleston. During this time they also acquired the neighboring Marshlands Plantation house and developed the property into a naval yard. The base officially closed in 1996 and the property was divided by the City of North Charleston and the South Carolina State Ports Authority. 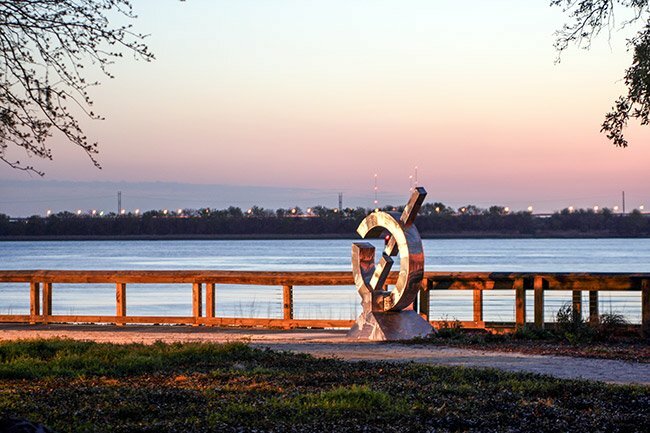 By 2001, the northern end of the former base was slated to become the largest urban revitalization project ever attempted in United States history and was to be called The Noisette Project. 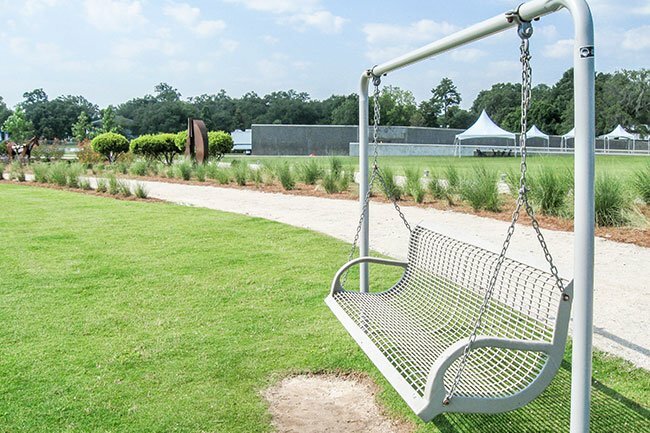 In this project Riverfront Park was created as a 200-acre park surrounding Noisette Creek. Thousands of housing units, millions of square feet of retail space and improvement of schools in the area was slated to take place. The Noisette Project eventually ran into foreclosure but not before the park was completed. 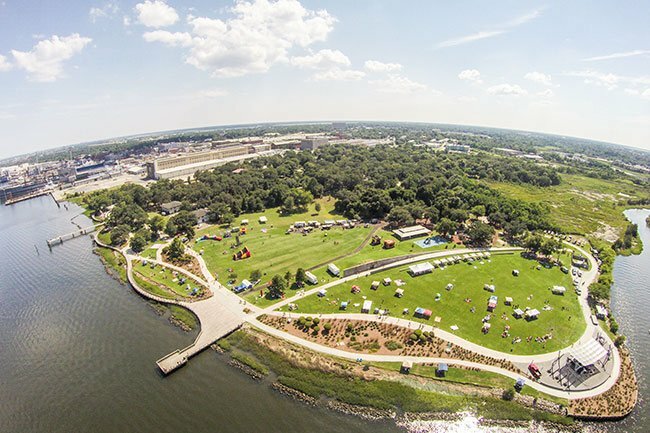 Riverfront Park was envisioned as a crown jewel by the City of North Charleston to be a refuge within the city where the public had access to the waterfront, outdoor activities and general recreation; something a city plagued with bad press, drug and crime-related activity was heavily lacking. 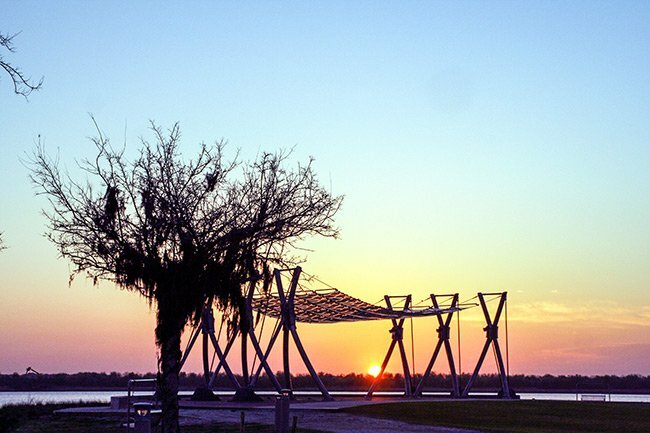 The park was completed in 2007 and features several key elements such as a military memorial, an 800-foot boardwalk along the river, fountains, fishing pier, playground, dog park and a state of the art amphitheater which plays host to wonderful outdoor concerts and events. The park has also become a well known space for both a revolving and fixed gallery of outdoor artwork by various sculptors and artists. 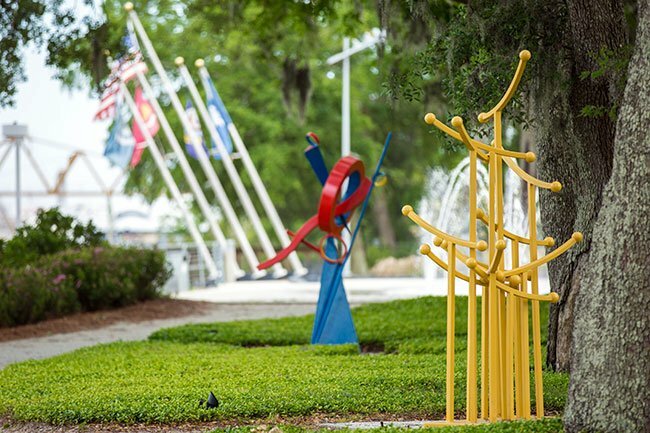 The artwork is part of the National Outdoor Sculpture Competition and Exhibition, run by the City of North Charleston Cultural Arts Department. 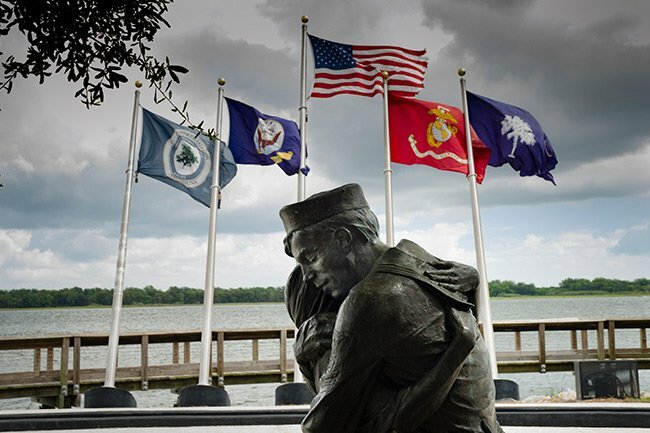 The military memorial seen at the park is known as the Greater Charleston Naval Base Memorial. 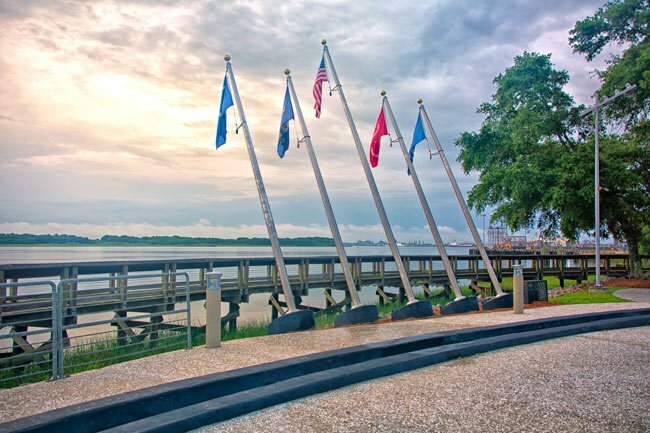 The memorial was planned by military veterans and the City of North Charleston to commemorate the countless men and women who served their country and this base during its 95 years of operation. An open pavilion shares the story of the base from its inception to its closing. 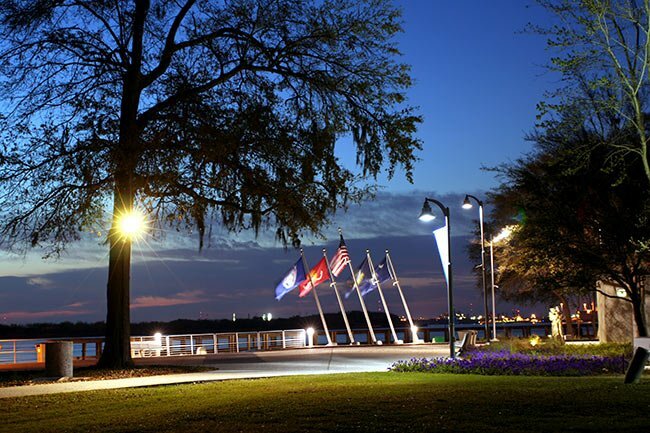 A stream is used to signify sailors crossing gangways and five lighted flagpoles showcase flags for the United States, South Carolina, North Charleston, the Navy and the Marine Corps. Memorialized bricks line the area showcasing names of those who helped with its creation. Two striking statues known as “The Lone Sailor” and “The Homecoming” by Stanley Blefield stand here. “The Homecoming”, seen below, is a statue expressing joy in the reunion between a sailor and their family. The original work is located in Washington, DC, with only three full size copies existing; the example here, one in Norfolk, Virginia and the last in San Diego, California. 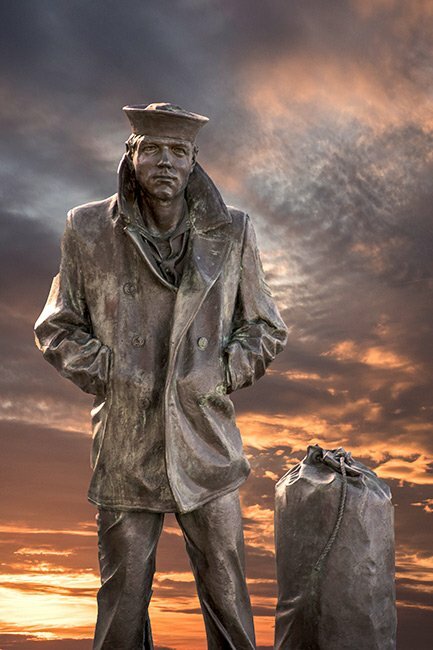 “The Lone Sailor” is a bronze copy of the original statue which stands at the United States Navy Memorial in Washington, D. C. Rear Admiral, William Thompson, was the first president of the Navy Memorial Foundation, which raised funds to create the original memorial in our nation’s capitol. Because of his efforts, the artist immortalized Thompson’s initials in the bag of the sculpture. Petty Officer First Class, Dan Maloney of the USS Alabama, was the model for the piece. The sculpture is one of several replicas found throughout the nation and was erected here in 2007. The performance pavilion is a fantastic contemporary structure at the end of an expansive lawn. The pavilion has played host to the city’s annual Fourth of July celebration, art finales and shows by regional performers. Larger events have been held here such as the Lipton’s Be More Tea Festival in 2016. This festival featured acts by nationally known bands such as The Roots and Passion Pit, elevating the park to a larger potential for future events. This space can also be rented for family reunions, weddings and more. Riverfront Park over the years has transformed this corner of the City of North Charleston into a peaceful haven. 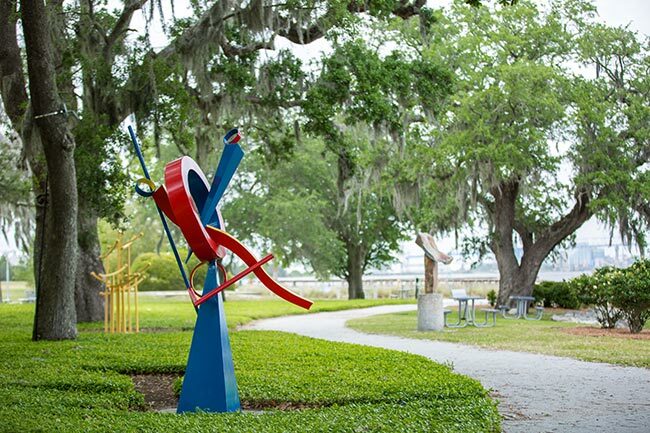 The community gathers together on any given day in a beautiful setting of old historic homes, gorgeous river views, graceful oak trees and wide open green space free for anyone to enjoy any time of day. 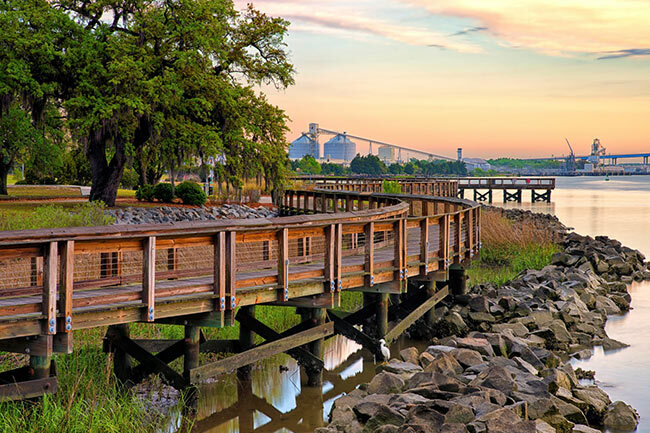 Whether you want to appreciate new artwork, fish in the natural waterways of the Lowcountry, have a picnic with your family, photograph a sunrise or sunset, take a stroll on the boardwalk, watch the cargo ships pass by, read a book on one of the many benches or just enjoy nature, you’re covered, Riverfront Park truly offers something for everyone. This place is so pretty, full of charm. Hi, Vicki. Here is the website for the City of North Charleston: http://www.northcharleston.org/ I hope you can find the information you need there. I am interested in purchasing a few bricks. Please send information.